After a sold-out run at The Royal Court, Let The Right One In reopens the Apollo with the kind of underplayed emotion that hits you right in the gut. Based on the Swedish novel and film of the same name, those familiar with the source material may constantly feel a step ahead of proceedings, but this is never an issue when taking place in a parallel world to its cinematic cousin. 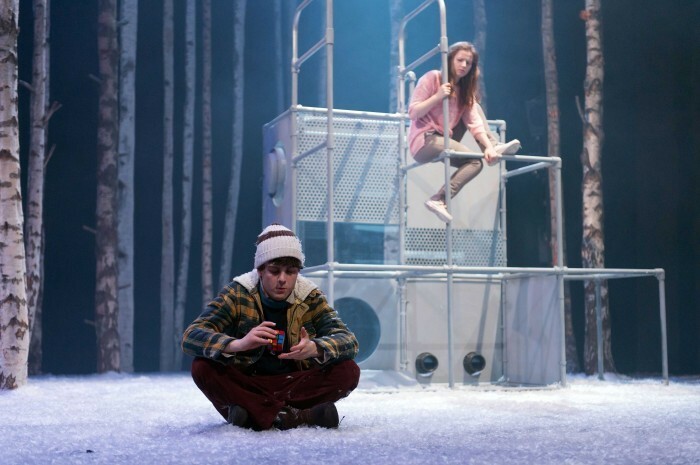 Seamlessly swapping Sweden for Scotland, the Scandinavian monikers remain, but central figures Eli and Oskar find their journeys fleshed out to great effect in Jack Thorne’s superb stage adaptation. A child of divorce and bullied at school, Oskar is unsure as to his place in the world. Luckily for him, he bumps into new neighbour Eli on his estate’s climbing frame. Unluckily for him, she has a taste for the stuff that’s flowing through his veins. Eli is enigmatic where Oskar is awkward, but their combined loneliness and need to adapt to their surroundings due to circumstance brings them together. However this friendship doesn’t go down well with Hakan, the unnerving father figure who serves to make sure Eli is well fed. So well fed, in fact, that members of the local community start dropping off the radar. Let The Right One In succeeds from the off with its gripping and incredibly personal appeal from a local policeman; the bare stage inviting us in. Though not initially easy to like, once Oskar and Eli warm to each other, so the audience does to them. Rebecca Benson is nothing short of sensational as the frozen in time object of Oskar’s affections, delivering an intense performance that asks a great deal of the actress. But she is matched every inch of the way by Martin Quinn in his professional stage debut; a loveable oddball who shares some fantastic moments of surprising comedy with his vampiric sidekick. Like the 2008 film and its subsequent American remake, this production contains moments that need to be seen to be believed. It is also not the out and out horror many wrongly assume – even if one particular moment gives the final beat of Carrie a run for its money. Set amongst the trees and snow, stunning contemporary choreography and a score by Olafur Arnalds, are combined with gravity defying acts and bloodied frenzies to dazzling effect. The set design may be incredibly simple, but a singular use of the elements may just cause your heart to stop during its chokingly tense, near-perfect final half hour. Oskar’s parents may get left by the wayside (the only characters not credited with names), but this is a very small niggle in a production that just about offers every emotion possible. The choice to deliver sporadic moments of technical wizardry guarantees John Tiffany’s direction is always steeped in reality, and, in turn, makes the supernatural flashes all the more impressive and shocking. An extraordinary production, it – like Eli herself – will struggle to age when it could arguably be set anywhere. Tender and heartbreaking, yet carnal and exhilarating, you’ll be dying to see it again. After all, who knew a Rubik’s Cube could hold such emotional weight? This entry was posted in Home, Reviews and tagged 2014, adaptation., apollo theatre, april, book, eli, film, John Ajvide Lindqvist, Låt den rätte komma in, let the right one in, london, martin quinn, national theatre of scotland, oskar, rebecca benson, review, royal court, shaftesbury avenue, sweden, swedish, theatre, vampire, west end. Bookmark the permalink.